“In my previous childcare, it took more than a month for kids to adjust. Here at Noah’s Ark it took less than a week. And they’re happy here.” –Heline Wolf, Mother of 3 and 5 year old children. Our Preschool program starts on last week in August and goes through first week in June. Most of the learning happens in the morning, though we will work individually with children who miss their morning learning time. Our three’s will learn to recognize letters of alphabet and numbers 1-10, colors and shapes, concepts of opposites, calendar and weather, etc. We teach them life and social skills, help them to learn to gain independence; through everyday interaction with other children they learn how to take turns, share, and use words to communicate their feelings. We have new learning topic every week: we incorporate art and craft activities, science experiments, circle time and building with blocks and manipulatives; we have music and movement time, finger plays and games; dramatic play and cooking; sand / water play (in warm season) and field trips (year-round). If you would like to see what our daily schedule for our Preschool 1 classroom looks like click here. The children who have been in our preschool program for 1 year now continue with their second year of preschool. They will now learn to write all the letters of alphabet, their names, and learn numbers 1-25. 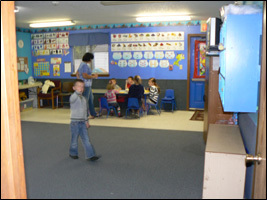 If you would like to see what our daily schedule for our Preschool 2 classroom looks like click here.